Kohsei Kitakyushu Plant is the only producer in Asia that has the high-purity degassing technology and large-lot production capacity. Our technology can bring O, N and S to an extreme low content such as 20ppm. 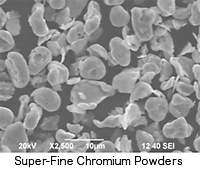 As one of the top suppliers of Chromium metal, Kohsei can adequately provide customers with high purity and high quality Cr flakes and powders, which are used for producing high quality Cr sputtering targets.